For the last few years, the village of Thaleba in Upper Burma has gotten very active in January. This is usually the time when we from Metta In Action (MIA) have visited this rural village in the wide expanse of flat land that lies north-west of Mandalay. All the visits in the previous years have been carefully planned and organised by Sayadaw U Indaka, the abbot of the Chanmyay Myaing Meditation Centre at the outskirts of Yangon, and a native of Thaleba. The preparations for these special visits are always time consuming and varied, consisting of getting all the school uniforms sown; putting up street lights, wires, and solar panels; evaluating kids from poor families; building a water tank and putting in water pipes in the school; or finishing the new medical clinic in time for the opening ceremony. Thaleba is a big rural village with a population of nearly 10,000 people. Most of the people are farmers and make their living by growing peanuts, beans, melons, wheat, rice, sunflowers, or sesame grains on the fertile fields that surround Thaleba. 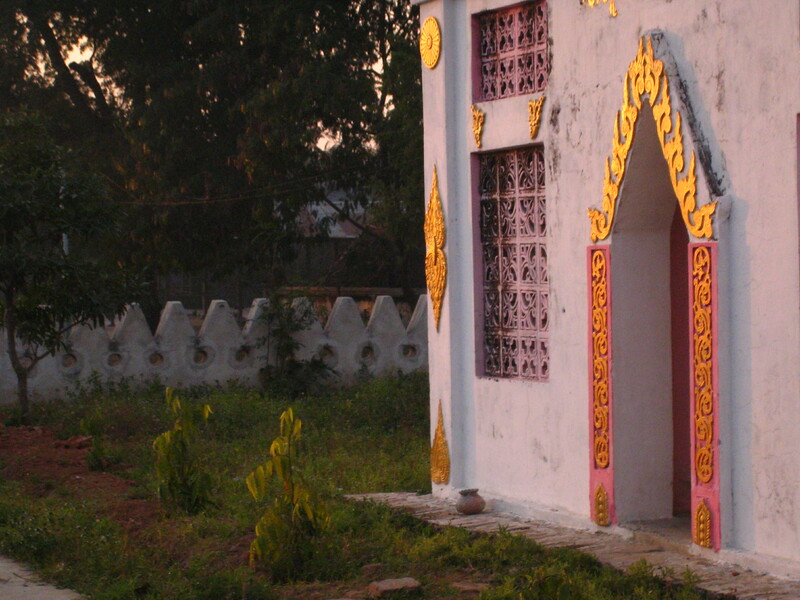 The village is situated on the banks of the Mu River which flows into the Irrawaddy River further south. 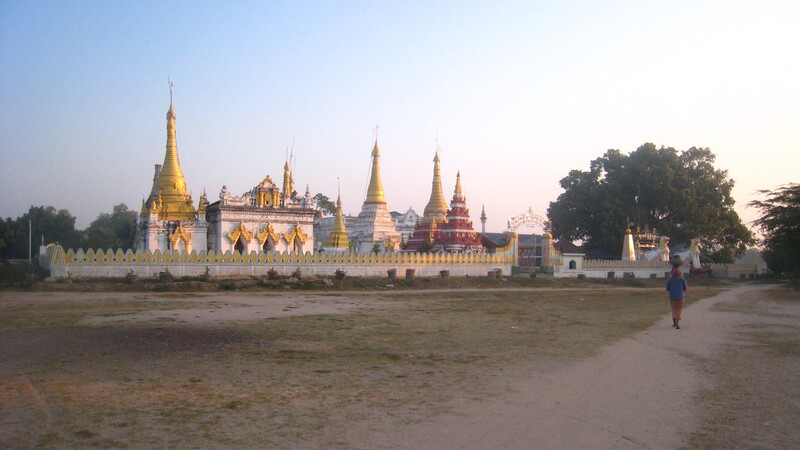 Thaleba can only be reached on very dusty and bumpy roads, either from the towns of Sadaung, Ayardaw, or Monywa. The way of life in Thaleba is still in harmony with the rhythm of nature. People usually get up before dawn to cook rice and curries for the day, to feed their cows, and to get ready for working in the fields during day time. 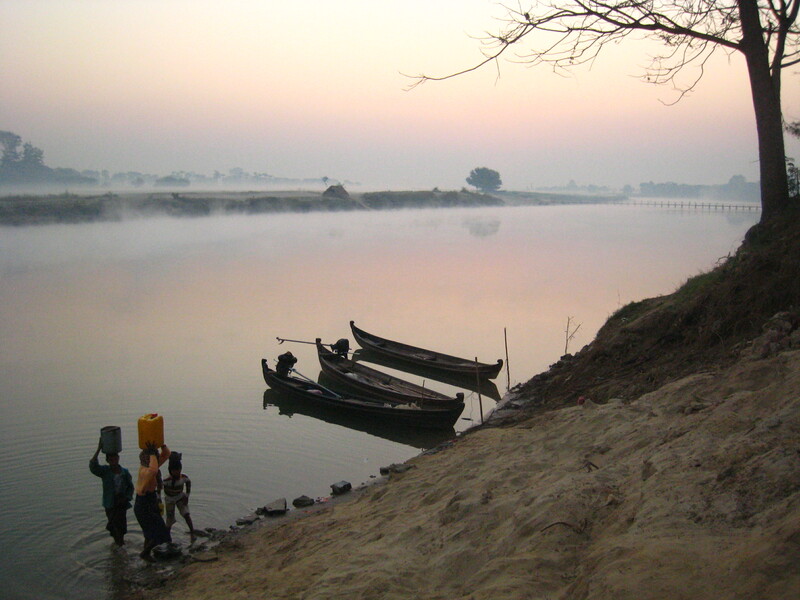 It is mostly the women or young boys who go down to the river just after dawn to get drinking water for their families. Later in the morning one can see the kids going to school. Traffic on the dirt roads in the village consists mostly of ox-carts. Only recently motor-bikes have started to appear on the streets. Thaleba could well become a ‘tourist attraction’ for stressed out westerners who seek solace from the business of modern life. There is no rush hour in Thaleba, no internet café, no luxury hotels (actually no hotels or guest houses at all), no McDonald’s, no ATM, no gym, no …. Of course, I could continue to paint an idealistic picture of Thaleba. But many villagers here are facing the same difficulties as a great number of people do all over the world: in case of sickness they cannot afford to see a doctor, kids cannot go to school, or the lack of electricity makes life much harder and dangerous. Last year MIA has offered four solar panels which produce enough electricity to light the two main streets across the village, the school, the library, and the two pagodas. This year we offered four more solar panels so that many of the little streets and the main street in the adjacent village can have light, too. 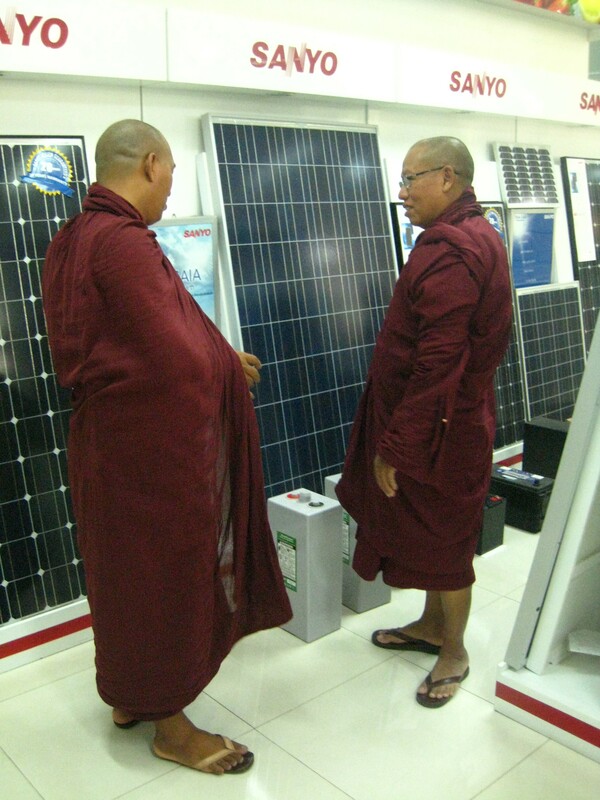 The prices for solar panels in Burma have dropped within this past year to almost half of what they were last year. Hopefully this will make it more attractive for Burmese people who in the absence of electricity provided by the government have been heavily dependent on generators. The people in Thaleba are very happy to have light at night. It makes going places easier and is less dangerous because venomous snakes (vipers) are a constant threat in that area. In the library, books can be chosen and/or read right there at night. peoples’ awareness for alternative forms of producing electricity. When we were walking through the village, we even spotted some small solar panels on peoples’ houses. These families have installed their own little solar panels to have electricity in their houses. And many people from other villages have come to inspect the solar panels and the street lights during the past year. Two years ago MIA set up a Health Fund in Thaleba which had two objectives: one was to offer medical treatment to the poorest of the old people, and the other was to treat snake bites. During the past year ten people have been bitten by Russell’s vipers. Without the injection of anti-venom these people would have died. Luckily, all of them were able to get to the doctor in time to have the life-saving injection. Sayadaw U Indaka had a vision of making medical treatment easier and more accessible for everybody in Thaleba, young and old, rich and poor. While figuring out how to implement this vision practically, the Shine Hope Company offered to build a little clinic in Thaleba. Already two years ago when the Health Fund was established, Dr. Khin Mar Thet offered traditional medicine to the old folks in the name of Shine Hope Company. This company produces traditional medicines and herbal products, using lingzhi (Reishi mushroom called by the Japanese) or pollen. In the morning of January 21, the old folks and many other people gathered at the new clinic. The building has two rooms for checking patients, a room for the doctor, a maternity room, a store room, a toilet, and the waiting room for patients. The official opening of the clinic was done with the traditional cutting of the ribbon which was preceded by many speeches given by various people. The already existing Health Fund for Elders was incorporated into the organisation of the new medical clinic. At an initial stage it will not only offer free medical treatment to all people in Thaleba who are older than 75 years but also continue to offer treatment for snake bites to anyone who gets bitten. Later on, the committee hopes to offer free medical treatment to more – ­and eventually to all – people living in Thaleba. 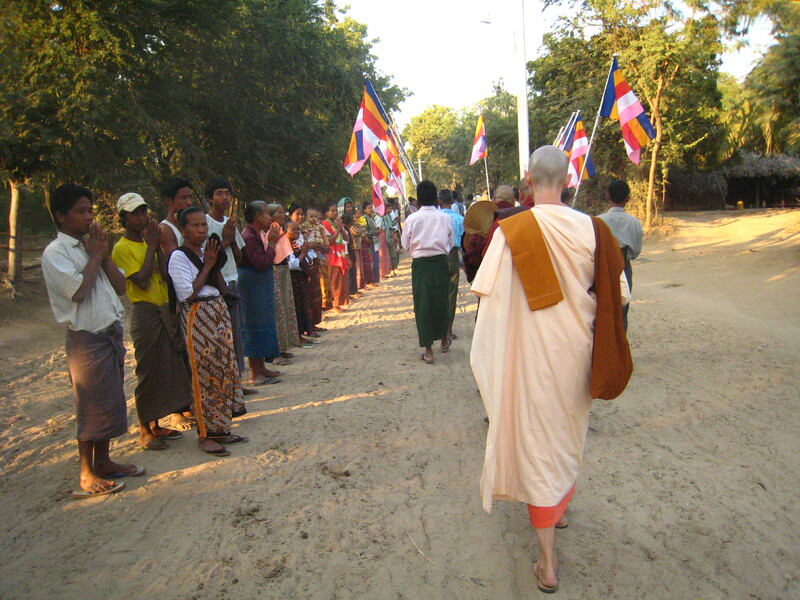 Sayadaw has set up this Health Fund (as well as the Education Fund in Thaleba) in a way that it can grow. The villagers in Thaleba can take loans from these funds with an interest of only three per cent. Usually when people take loans they have to pay at least five per cent interest, if not more! In this way, both parties profit: the Funds are growing and the villagers are no longer at the mercy of unscrupulous money lenders. This system has worked very well, both the Education and Health Funds have grown in the past few years! To complement the Thaleba Health Fund MIA has offered some more money so that they have a solid basis from which to work. In the west, many people are aware that trees are substantial for surviving on this planet, and that they are important for a healthy and functioning eco-system. Besides this, there are many more benefits from having or planting trees such as providing fuel, a shady place to take rest, or a home for birds and other beings. On our previous visit to Thaleba we were concerned that the trees lining the road going out to the fields would soon disappear as they were being cut for fuel. The villagers assured us that they do not cut the entire tree, but only its branches and that these trees are fast re-growing. But the villagers said that it would be nice to have trees planted on the compound of the two pagodas. The trees would offer shade to all who went to the pagoda, be it for just a leisurely stroll around the many little pagodas or be it for sitting down and reciting some prayers or practising meditation. For many Burmese people a pagoda is also a place where one can just sit down and do nothing, or where one can enjoy the silence and quietness of the place. With the money we donated last year, many trees have been planted at both pagodas. The young trees are regularly watered because there is no rain during the cool and hot seasons which last from November to June. To make the watering of the trees easy a water pipe has been built from the school to the compound of the pagoda. When we looked around at the pagoda, two young women came to change the water of the flowers that had been offered to some of the shrines. They proudly explained that they have voluntarily taken up this ‘duty’ and that it was the novices’ duty from the nearby monastery to water the trees. On Sunday afternoon we left Thaleba – leaving behind a fair amount of dana and taking with us much joy and satisfaction. It is only thanks to your generous support that people have survived a deadly snake bite, kids can go to school, old folks can get medical treatment, and more trees are growing on this planet. Your contribution definitely makes a difference in peoples’ life!